Apple has officially releases the full and final version of OS X Server 4.0.3 (Build: 14S350) Update to all Mac OS X Yosemite 10.10.x users for installation / updation / upgradation instantly. The Direct Download Link of OS X Server 4.0.3 (14S350) Update .DMG File is available. According to release notes and changelog of latest OS X Server 4.0.3 (14S350) Update Final Version, it includes addition of several new features, functionalities, fixes, improvements, enhancements etc. which you can read in below image! 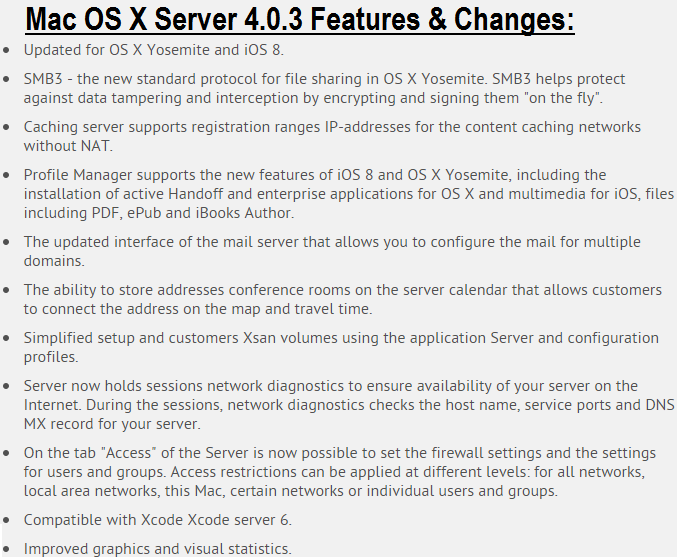 How to Download & Install OS X Server 4.0.3 Update? Apple's OS X Server 4.0.3 is available in 9 multiple different languages i.e. ; English UK, English US, Korean, Chinese, Spanish, Dutch, French, Italian, Japanese and German. Mac users can manually install the latest version via Mac App Store >> Software Update option for Free, Or you can also Download OS X Server 4.0.3 (14S350) Update .DMG File via Direct Links.